I’m trying to remember my first encounter with hippie food. I know that I’d eaten whole wheat bread and home-grown vegetables my whole life, but my first memory of eating food that was created as a countercultural statement was when I was a student at the University of Illinois. 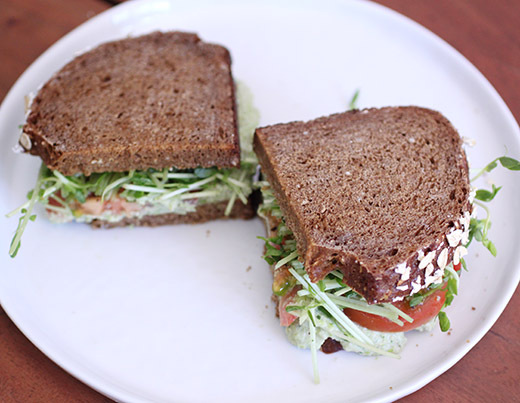 There was a little, vegetarian cafe in Urbana called Nature’s Table, and I fell for their garbanzo spread sandwich on whole grain bread. I hadn’t thought about that place in years, but it came back to me as I read a review copy of Hippie Food: How Back-to-the-Landers, Longhairs, and Revolutionaries Changed the Way We Eat . This book looks back at the origins of what we’ve come to call “hippie food” and how many products that used to be hidden away in health food stores became mainstream. It all might have started in the 1950s in California where optimum health and trust in nature became linked to food choices. Soon thereafter, interest in macrobiotic diets were on the rise and a demand for organically-grown brown rice developed. At first, there weren’t always scientific reasons to back up various nutritional claims, but the idea that food grown without harsh chemicals is better for people and the planet began to resonate in health food circles. Just when industrialized farming was taking off, this nascent call for doing things the old-fashioned way arrived. It was interesting to read how the Lundberg family in California became a leader in growing rice organically. Following the interest in brown rice came the return to whole wheat. White bread became a symbol of the industrial, over-commercialized food system. Recipes for baking whole wheat bread at home began circulating. All the while, more health food stores and cafes cropped up around the country. Health food buying coops appeared as well, and I was interested to read about the start of Austin’s own Wheatsville Coop that is still in business today. Speaking of Austin, all of this also led to Whole Foods Market that started here as well. Hippie food often has a negative connotation as bland or boring in its meatlessness, but it’s come a long way. I’m so glad ingredients like all sorts of whole grain flours, brown rice, and organic produce have gained popularity and can be found everywhere. And, I’m thrilled that we now have so many cookbooks and magazines to inspire delicious ways to use those ingredients. This book and memories of Nature’s Table had me craving a vegetarian sandwich on whole grain bread. 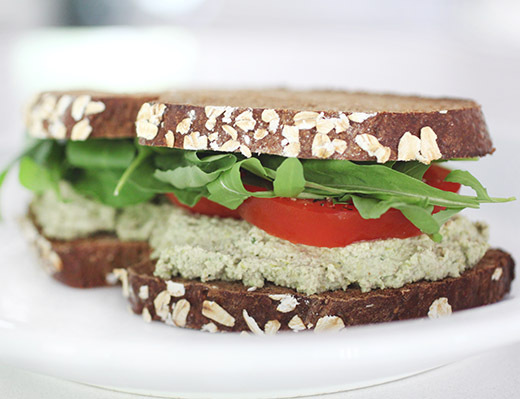 I’d just seen the Edamame Pate Sandwich in Clean Eating, and I decided to bake my own bread for it. When I read A New Way to Bake , I had marked the page for Molasses Oat Bread, and this was a perfect use for it. It’s an easy bread to make too. Boiling water was poured over some oats, and molasses was added. 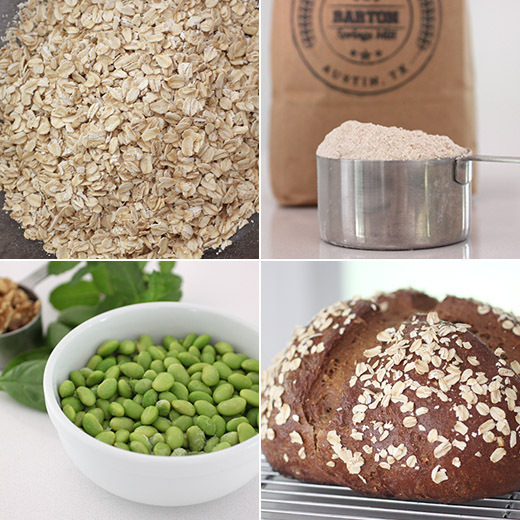 While it sat, more oats were coarsely ground in a food processor and then added to a bowl with whole wheat flour, bread flour, dry milk, and salt. Yeast was added to the oat-molasses mixture before it was combined with the flour mixture. The dough was kneaded and left to rise before being shaped and left to rise again. Before baking, the loaf was scored, brushed with egg white, and topped with oats. For the edamame pate, thawed shelled edamame were pureed with walnuts, mint, green onion, salt, lemon juice, and a little water. I made a few different sandwiches. Some were made with pea sprouts, some had home-grown arugula, and some were open-faced with just tomato. The molasses oat bread was a fitting and delicious vehicle for the edamame pate. It’s been too long since I last had that vegetarian sandwich at Nature’s Table, so I would be able to compare the two. But, I do know that Nature’s Table wasn’t using fresh, local tomatoes on their sandwiches back then, and that gave my edamame sandwich a big boost. Is this modern hippie food? Evolved hippie food? Whatever the label for this kind of eating, I hope the concept continues. Everything homemade...awesome! That edamame pate is really special, bet it tastes fabulous. Edamame pate is a FUN idea! Good color, too. :-) Thanks! that's a heck of a sandwich! edamame pate sounds pretty brilliant and delicious to me! Wow, the memories of hippie food are coming back!I remember all the 'health food' stores that sprung up back in the 60s- there were lots of 'bean sprout sandwiches' being served. (BTW, I also remember that the University of Illinois at Urbana had a good dance department). Edamame pate? That's a nice new concept for me! So funny. I remember hippie food and when everyone was making their own yogurt. And this. Now this seems so passe and all of the "other" diets have taken over. I'd be happy with just hippie food.